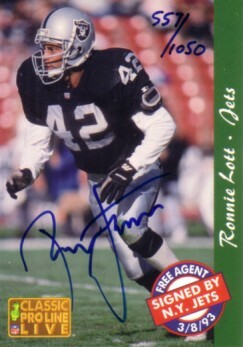 1993 Classic Pro Line certified autograph card of Hall of Fame safety Ronnie Lott (depicted with the Raiders although the card says Jets). #557 of 1050 card signed. Back has congratulatory message confirming authenticity. With certificate of authenticity from AutographsForSale.com. ONLY ONE AVAILABLE FOR SALE.